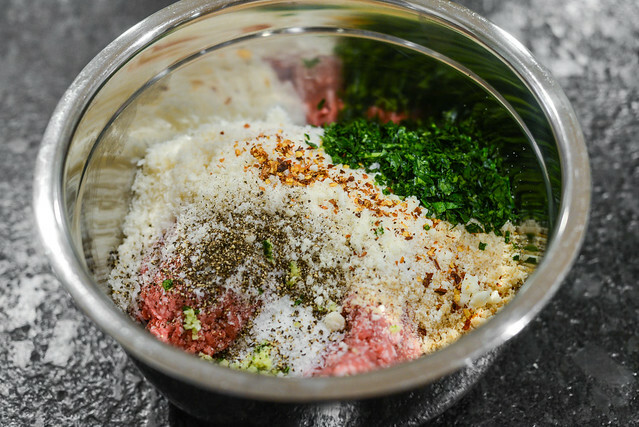 A key component of making a meatball that stays tender over high heat, and potentially excessive cooking, is using fresh breadcrumbs. Since most all breadcrumbs you'll find in the store are dried, I started off this recipe by pulsing some slices of soft white bread into the light and fluffy breadcrumbs I needed. 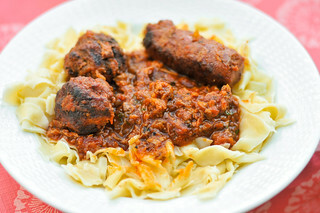 I then kept my base meatball recipe as is—why mess with something already proven to work and be loved? 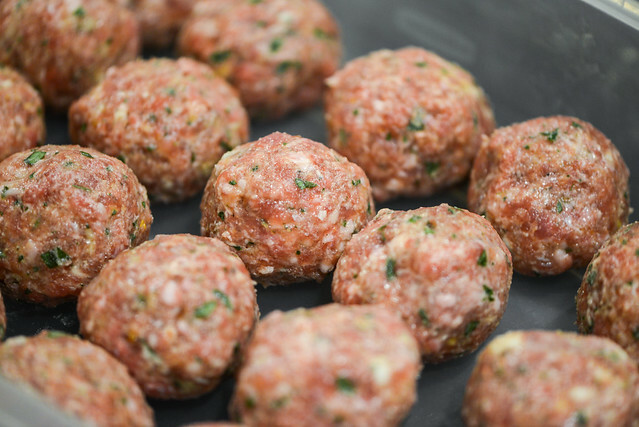 This mixture of beef and pork was heavily seasoned by cheese, using a combo of parmesan and pecorino romano to give the meatballs a great salty and savory quality. To further their Italian profile, I used parsley, garlic, and crushed red pepper. Then, besides the required salt and pepper, the only other ingredient was egg, which helped bind the mixture together. While I had full confidence in what I was doing for the meatballs themselves, the same couldn't be said for the cheese stuffing. My first thought was to use cubes of mozzarella, but then I started worrying that they might not melt all the way, the flavor may be too delicate for heavily seasoned meat, and/or the mozzarella alone would be too soft and moist and explode out of its meat enclosure. It was only after much internal deliberation that I decided to go with a mix of grated low moisture mozzarella and sharp provolone, thinking this would give me the right combo of flavor, quick melting, and not be watery. To make the meatballs, I broke off the amount of meat I would normally use to make ball roughly 1 1/2-inches in diameter. 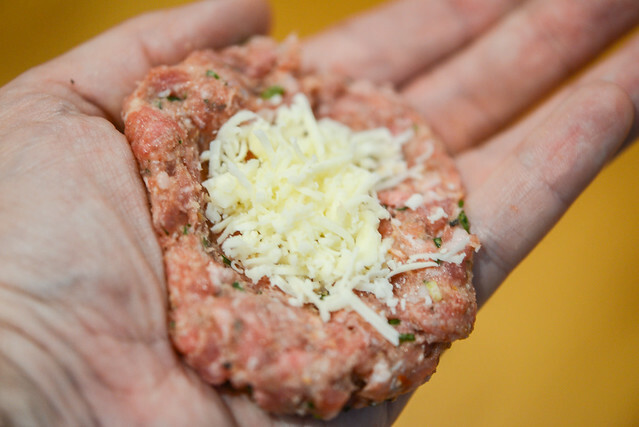 I then flattened the meat in the palm of my hand and placed about a tablespoon of the the cheese combo in the center. I then folded the sides of the meat together, pinched them closed to seal, and rolled the meat in my hands until it was a nice spherical shape. The first few were a little tricky to get right, but I quickly got the hang of stuffing, closing, and rolling to make the chore of making stuffed-meatballs only slightly more cumbersome than regular meatballs. It didn't seem too bad of an extra effort for the potentially great and impressive added bonus. I had pretty founded fears that all the work done so far would go horribly awry on the grill—it's very easy for the meat to break and allow an escape route for that precious cheese inside. Luckily, I had very few bursts, and grilling these as normal, over direct heat until well browned and cooked through, worked fine. It wasn't until I cut into one though that I knew my experiment was an initial success—the cheese all remained safely inside and was perfectly melted. The second triumph was in the flavor, which was a cheese lovers dream. 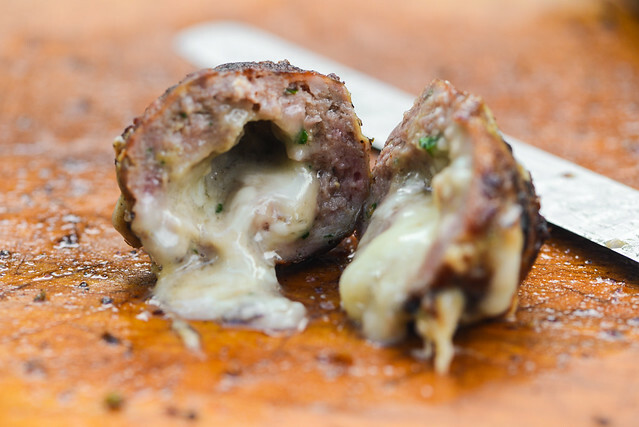 The meatballs had the great sharp tastes of pecorino and parmesan baked in, while the innards provided the creamy cheese element along with enough flavor from the provolone to make it stand out against the meat itself. We enjoyed these both just dipped in some marinara and also assembled into a little sandwiches, where the red sauce was also accompanied by Italian salsa verde. 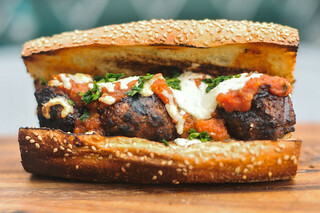 Either way, they provided the comfort of that original recipe that has become a Meatwave standard, but with a twist that made them feel new and exciting again. 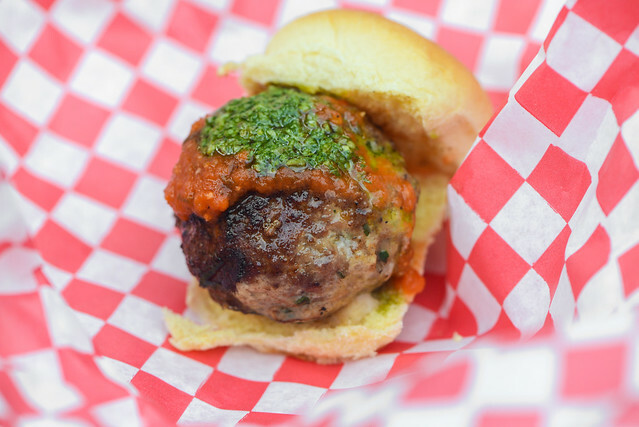 A well seasoned Italian meatball holds a melty and delicious surprise in its center. Place ground beef, pork, bread crumbs, eggs, parmesan, pecorino romano, parsley, garlic, salt, black pepper, and red pepper flakes in a large bowl. 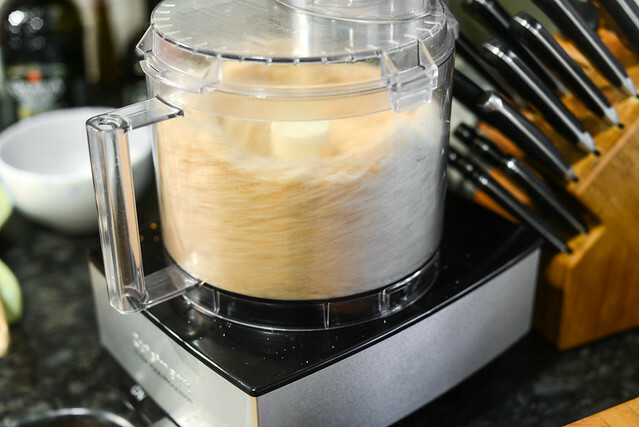 Using your hands, mix together until thoroughly combined. Break off enough meat mixture to roll into a ball approximately 1 1/2 inches in diameter. 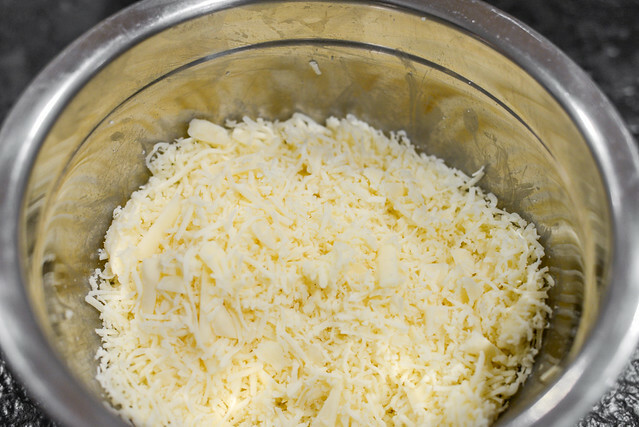 Flatten meat in palm of your hand and place 1 tablespoon of mixed mozzarella and provolone cheese in center. Fold sides of meat around cheese and pinch closed. Roll meat in hands to form a round meatball. Repeat with remaining meat mixture and cheese. Light one chimney full of charcoal. When all the charcoal is lit and covered with gray ash, pour out and spread the coals evenly over entire surface of coal grate. Set cooking grate in place, cover grill and allow to preheat for 5 minutes. Clean and oil the grilling grate. 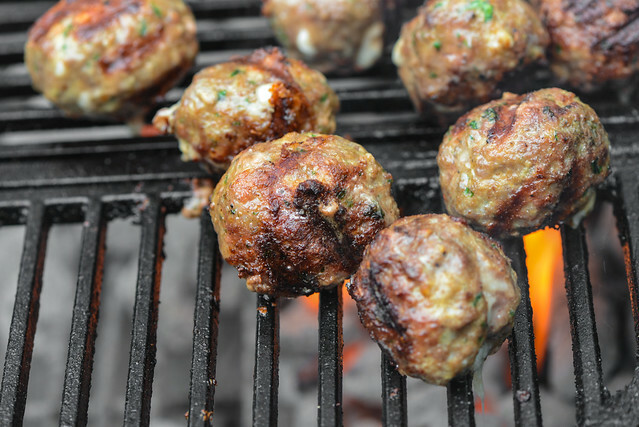 Place meatballs on grill and cook, turning occasionally, until well browned all over and cooked through, about 8 minutes total. 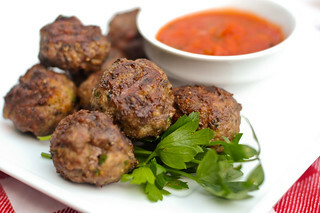 Transfer meatballs to a serving platter and let rest for up to 5 minutes. 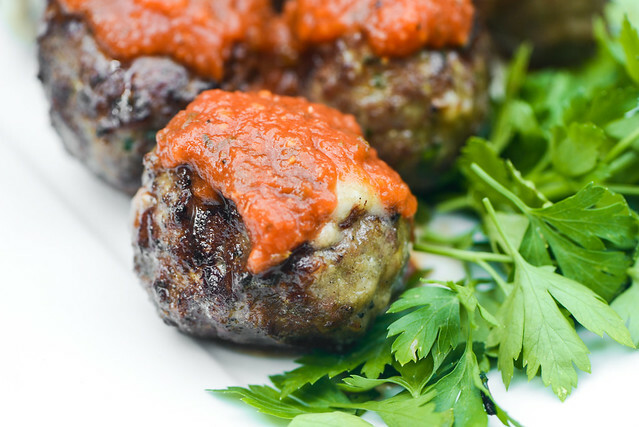 Serve immediately with marinara sauce for dipping.